Model railroad accessories enhance model railroads' visual and operational realism. 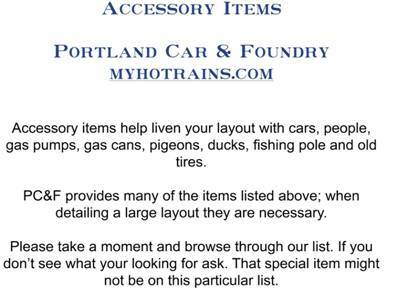 Portland Car & Foundry offers a widely diverse line of HO scale model railroad accessories. We have developed many of our specialty items during custom car problem-solving sessions. For example, our brass baggage car end doors eliminate the unsightly "gap-osis" we encountered with standard Athearn baggage and BME railroad cars. The products listed here represent the best in the Steam and Transition Era. ***Fire service equipment works twenty year on first line call, works 5 years on standby, and 5 years reserve status before mandatory retirement.